New PTU kit Tutorial "Tropical Getaway "
The tags I make from this tutorial will for sure go to my Family. The PTU kit I am using is from Black Widow Creationz & it's called Boricua 4 Eva. The tube I am using is from Keith Garvey & is called Bratz. You can purchase it at PTE. First, open a 600 x 600 transparent canvas. C/P BWC_Boricua4eva_EL37 & resize 50%. Place element where you'd like. I placed mine on the top right. Using your magic wand, click inside the star. C/P tube of choice. I am using Keith Garvey's Bratz tube (closeup). Resize to 30% & paste into the star. C/P tube at bottom of canvas. C/P BWC_Boricua4eva_EL7 & resize 30%. C/P BWC_Boricua4eva_EL12 & resize 30%. C/P BWC_Boricua4eva_EL11 & resize 30%. C/P BWC_Boricua4eva_EL17 & resize 60%. C/P BWC_Boricua4eva_EL40 & resize 90%. Also, lets drag this layer just above the background layer. Staying on that layer, C/P BWC_Boricua4eva_EL41, Mirror & resize 90%. Now going back up to your Raster layer 8, select it. C/P BWC_Borica4eva_EL20 & resize 50%. C/P BWC_Boricua4eva_EL57 & resize 30%. C/P Brad1 & resize 50%. For the Tag Phrase, please flip the colors around. To me, the Phrase showed up better. 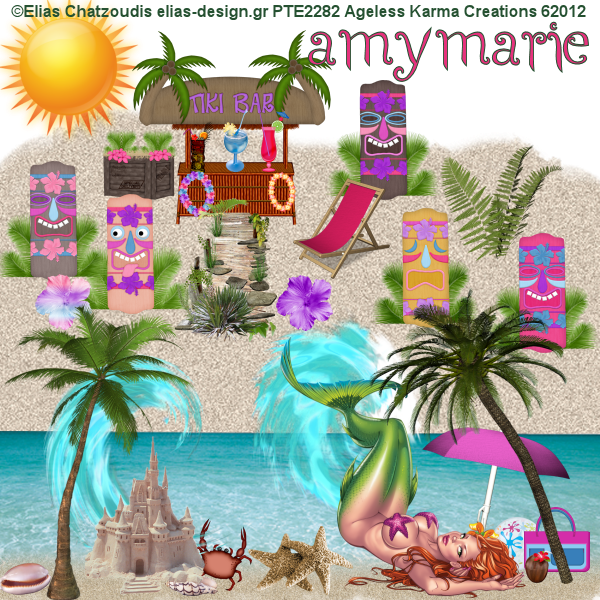 I am using AmyMarie's Tropical Fun PTU kit & you can purchase it here. I am also using Elias Chatzoudis tube called Hermione. You must have a license to use his work & both can be purchased at PTE. To start off, I will be using C/P for Copy/Paste. Also, please use my tag as reference as to where to place your elements. C/P SandAM12 & duplicate twice. Place dups where they overlap to make one long line of sand. C/P sand1 & duplicate twice. Place dups where they overlap to make on long line of sand. C/P wave2, wave3 & resize 50%. C/P brella3 & resize 40%. C/P your tube of choice. If you are using the same tube as I am (Hermione) resize to 50%. C/P beachbag & resize 20%. C/P palmtree1, palmtree3 & resize 50%. C/P sandcastle3 & resize 40%. C/P ccndrink12 & resize 10%. C/P shell1, shell2 & resize 15%. C/P Tikibar & resize 20%. C/P crate & resize 20%. C/P bb1 & resize 15%. C/P crab & resize 30%. C/P sun & resize 30%. C/P Tikibarsign1 & resize 50%. C/P Tikimask1, Tikimask2, Tikimask3, Tikimask4, Tikitmask5 & resize all to 30%. C/P starfishs & resize 30%. These next set of elements will be resized to 10%. I used the same colors as below, but for the font I used Arial. The PTU kit I am using is called A Beautiful Innocence by Creative Scraps by Crys. I am using the tube called ColorSeriesTeal by Keith Garvey. It can be purchased at PTE & you can also request a license to use his work from that website as well. Open a 600 x 600 canvas. C/P ABI_Paper_6 & resize 75%. C/P ABI_Element_10 & resize 30%. C/P ABI _Element_11 & resize 30%. C/P ABI_Element_58 & resize 40%. C/P ABI_Element_57 & resize 40%. C/P ABI_Element_24 & resize 40%. C/P ABI_Element_27 & resize 30%. I'd like to see your results of this tutorial. Please send them to agelesskarmacreations@yahoo.com. The kit I am using is called Midnight in Paris. 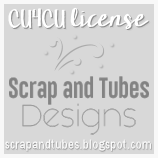 It is a PTU kit by Creative Scraps by Crys. You can get it here. The tube I am using is called ColorSeriesPeach by Keith Garvey. You can purchase it & a license to use his work at PSP Tubes Emporium. Also, please use my tag as a reference as to place your elements. Open 600 x 600 canvas. Using your magic wand, Click inside frame. C/P MIP_Paper _10 & drag below frame layer. C/P MIP_Element_4 & resize 40%. C/P MIP_Element_5 & resize 60%. C/P MIP_Element_40 & resize 50%. C/P MIP_Element_15 & resize 40%. 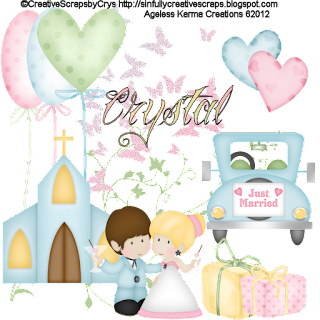 Spring Wedding Kit Scraps are by Creative Scraps by Crys. You can get this FTU kit here. In this tutorial, I will use C/P for Copy/Paste. Please use my tag as a reference as to where to place elements. C/P SW_Church & resize 50%. C/P SW_Couple & resize 40%. C/P SW_Car & resize 40%. C/P SW_Presents & resize 30%. C/P SW_Presents2 & resize 30%. C/P SW_Balloon3, SW_Balloon2 & SW_Balloon. Drag these 3 elements below the church. C/P SW_Hearts & SW_Hearts2 & resize 30%. I'd love to see your results! Please email them to agelesskarmacreations@yahoo.com.